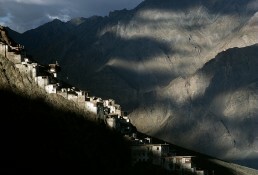 Karsha Monastery, Ladakh, Zanskar, Indian Himalayas. The Karsha Buddhist monastery is located 3600 metres above the inaccessible Zanskar plain in the heart of the Indian Himalayas. Three years passed before I was able to capture this picture. Success came on the day of an exceptional autumn storm.